The Sony HXR-MC2500 provides a professional look and shooting style which is ideal for weddings, corporate communications or education facilities. While light and easily portable, its full Shoulder Mount design means your clients immediately know you mean business. Workflow flexibility is enhanced by the ability to record directly onto a removable memory card or a 32GB internal flash memory storage system in High Definition or Standard Definition. With this combination of the internal flash memory and memory card allows recording functions such as "Relay" and "Simultaneous" are available. When Sony's L-Series Info Lithium battery NP-F970 (optional) is used, the Sony HXR-MC2500 is capable of continuous long recording of up to 14 hours- perfect for those occasions where you don't want to stop recording, such as weddings or business conferences. The Sony HXR-MC2500 comes equipped with a sophisticated G Lens that incorporates Sony's unique optical design technology and quality control, delivering exceptional performance on a par with some of the best lenses in the industry. The Sony HXR-MC2500 itself is optimized to perfectly complement the G Lens with an advanced image sensor and Sony's famous image processing technology. This improves picture performance whether zooming in on the action, or getting a perspective on the big picture with a 26.8mm* lens offering the widest angles in this class of camera, which enables wide-angle shooting even in tight spaces. 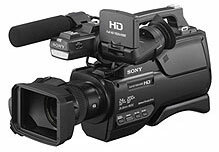 The Sony HXR-MC2500 is capable of shooting clearly even in low-light or indoor environments. Its highly-sensitive Exmor™ R CMOS sensor adopts a back-illuminated technology that enables the image sensor to utilize incidental light more efficiently, helping the video-grapher to achieve rich image quality even during low-light shooting situations. Moreover, the Sony HXR-MC2500 is also equipped with a convenient built-in LED light for valuable extra illumination when needed. The Sony HXR-MC2500 is equipped with an OLED Tru-Finder™ electronic viewfinder, offering a high resolution of approximately 1.44 million dots with high contrast levels. Sony's proprietary viewfinder technologies allow for better tonal reproduction and more detailed picture information when shooting. In addition, there is also the built-in 3-inch wide high resolution LCD panel (approximately 0.92 million dots) for crisp and bright views. The Sony HXR-MC2500 can connect to mobile devices such as smart phones or tablets via a Wi-Fi connection, enabling monitoring and remote control functions such as start/stop recording, zoom control, iris control and touch auto focus. Furthermore, it is also NFC-capable (Near Field Communications) to allow easy, one-touch wireless connections to compatible mobile devices. The Sony HXR-MC2500 MI Shoe expands your options to use accessories without cables, such as the UWP-D11 wireless microphone receiver and XLR audio input by XLR adapter. 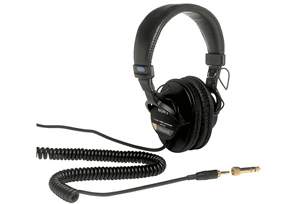 Built-in Microphone Omni-directional stereo electret condenser microphone.